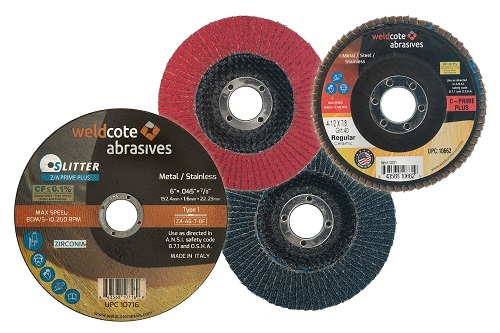 Weldcote Metals’ comprehensive line of metalworking abrasives is now available. The entire line includes more than 900 new SKUs. Leading the new offering is a line of flap discs, all made in the U.S. With multiple bonding and backing systems, backing plates and design shapes, the discs will handle a wide variety of applications. The flap disc materials, formulated for a wide variety of metals, include ceramic (C-Prime and C-Prime Plus), zirconia (Z-Prime and Z-Solid), aluminum oxide (A-Prime) and aluminum (ALU-Prime). Rounding out the new offering is U.S.-made quick change discs, as well as Korner flap discs, resin fibre discs and flap wheels. High-quality, resin-bonded abrasives are now available in the U.S. due to an exclusive relationship with a renowned Italian abrasives manufacturer (PRIME brand), as well as a partnership with a well-known Chinese supplier (SOLID brand). Finally, the Weldcote abrasive program also covers a full line of cutting wheels (branded as SLITTER), Notch pipeline wheels and grinding wheels. The full line of abrasives is now available for order. The Weldcote abrasives catalog can be viewed at www.weldcotemetals.com and are now available for shipment by contacting a local Weldcote sales rep or by calling the Niles facility at 224.998.2600.